Baidu had previously featured 5 different faces on their logo (from snowstorm survivors to Hong King entertainers) and yesterday the sixth person to grace the Baidu home page logo was Barack Obama. 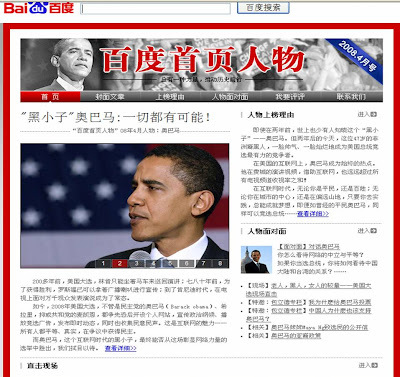 Clicking on the home page image took users to http://renwu.baidu.com/ which contains lots of Obama information in Chinese. There was no official explanation of the adornment of Obama on the Baidu logo, nor was there any official endorsement of Obama by the Search Engine. Slightly surreal, but given the size of Baidu's user base this is definitely something to pay attention to over coming months!